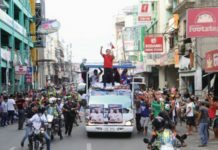 TACLOBAN CITY- Football superstar David Beckham visited this city and the nearby town of Tanauan, this week and in the process providing comfort and cheer to the victims, particularly children, of supertyphoon Yolanda. Beckham arrived in this city on February 13 at the Daniel Z. Romualdez Airport and immediately proceeded to the Tacloban Convention Center or astrodome, now temporary homes to more than 400 families. There, he stayed for more than an hour, interacting with the kids, cajoling babies and asked the mothers how they were coping after the massive disaster that struck this city three months ago. Jade Maceda, a 13 year old boy who was among the 300 lucky children who met the global superstar said that he and other children gave Backham a massage at his back. “He just kept on smiling while we were giving him a massage at his back,” the boy said. He also admitted that he has no idea who was Beckham, considered to be one of the most familiar faces in the world and one of the most popular soccer players. The 38-year soccer player arrived at the area at 1:38 p.m. amid tight security provided by the local police and burly white men apparently hired by the Unicef(United Nations Children’s Fund)of which Beckham is one of its ambassador of goodwill. 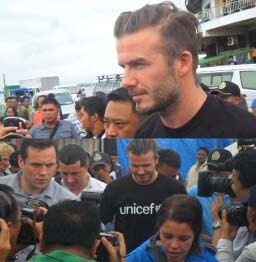 Upon disembarking from a vehicle, Beckham mobbed by the media, evacuees and kibitzers immediately proceeded to a white tent provided by the Unicef where he met the 300 children, all survivors of the Supertyphoon Yolanda. There, he sat in one corner of the huge tent where the children entertained him by singing “Ako ay Pilipino, “among others. They also gave Beckham flowers made by the children from a colored paper. In turn, Beckham also created his own heart artwork made colored paper. “I only see him in television. But now, I was able to see him up close and personal,” the 27-year old Sacramento said. And the following day, Beckham visited Barangay Santo Nino, a coastal village of Tanauan where he played soccer with 15 kids of the barangay. John Kelvin Dado, 12, said that he was happy not only to see Beckham in person but had a rare chance to play with him at their school’s grounds. “I just see him in television but for almost 20 minutes, we see him play with us here. 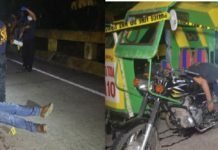 We shake his hands which were sweaty,” the Grade 6 student of the Santo Nino Elementary School of said village said. Beckham also visited the house of couple Trinidad Ojeda and her partner Rodolfo Mueba whose youngest child, Viana, died due to the typhoon. The couple’s two other children, Vince and Venus, survived the tragedy. “He consoled us saying that everything happened for a purpose and we’re all be OK,” Ojeda said. According to the couple, Beckham stayed at their house for almost 30 minutes as he asked them how they are now living after the storm and if they are being provided with aid, particularly by the UNICEF. “He kept on asking how we are now and if everything’s okay with us. He also promised to return and give possible help to our family,”Ojeda said. “Of course, we were happy. He really went out of his way just to be with us, “her husband, Rodolfo, said. Aside from giving the family a rare photo with him, Beckham also signed his signature with his soccer number 23 at Sharina’s notebook. “I have a personal souvenir from him,” Sharina giggled as she revealed that Beckham even changed his wet shirt before them.